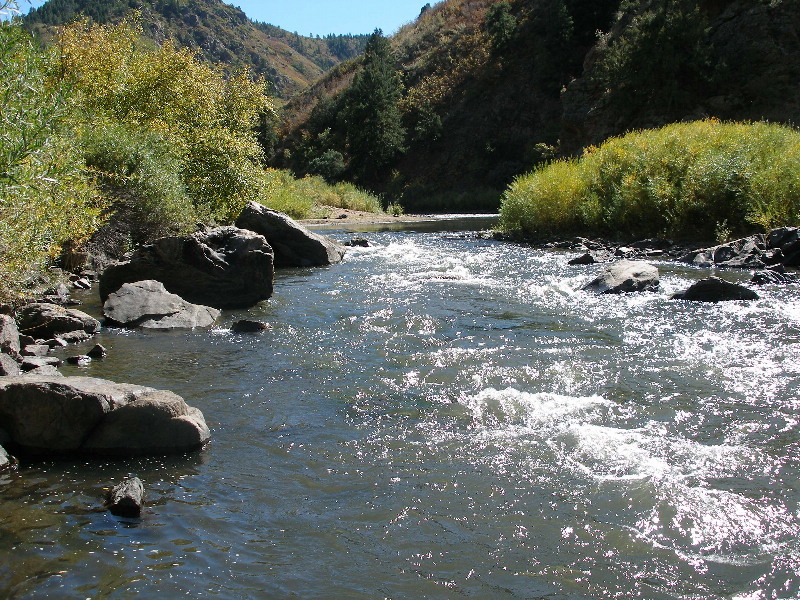 Another trip to the South Platte River in Waterton Canyon resulted in twelve fish landed, however, I did take photos or document with a fishing report. Jane and I loaded our bikes on the RAV on October 8 and headed to the Waterton Canyon parking lot. It was a beautiful day with high temperatures expected to be 70 degrees, although nasty weather was forecast for Sunday. We biked the four or five miles up the dirt road in the canyon to the picnic table just beyond the first bridge above the lake. A guy was standing in the large pool that I fished with moderate success the previous Sunday. I tied four size 22 CDC BWO’s Saturday morning in case a BWO hatch once again materialized. I put on my waders and began working the next upstream pool above the large bend pool. Almost immediately I noticed some sporadic rises, so I tied on a gray Madam X and then added a yellow beadhead caddis pupa below it. When I spotted some emerging BWO’s, I tied another length of tippet below the yellow caddis pupa and then added a WD40. I encouraged a flash to the Madam X, but the flies were not producing, so I cut everything off and tied on one of the CDC BWO’s, that I produced earlier in the day. I made two with a BWO poly body and two with a lighter olive poly body. The darker body was not generating interest, so I switched to the lighter color. Almost immediately my fortunes improved, and I landed eight trout over the next several hours. 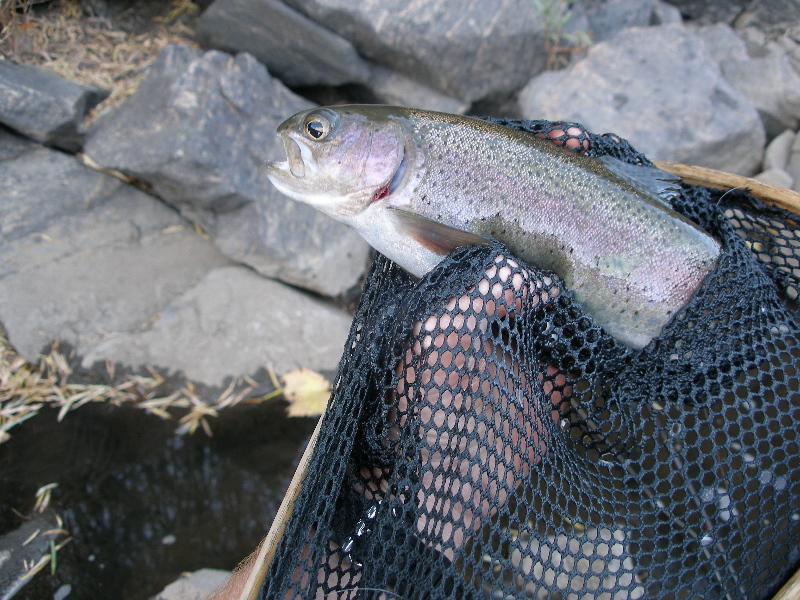 Six of the netted fish were rainbows or cutbows, and two were small browns. 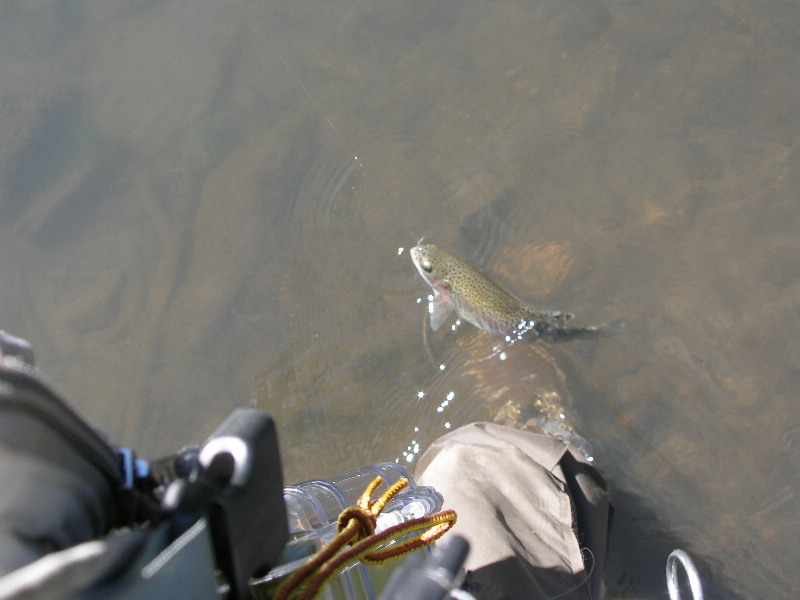 One of the cutbows looked more like a cutthroat than a rainbow, as It displayed lots of speckles and a slash under its mouth. The success required numerous casts, and the sporadic nature of the rises caused me to spray casts to many food lanes. After I landed five or so, the gentleman in the prime pool below me approached to learn what I was using. He had a box full of olives of varying sizes, and said he was using them with fish rising all over the place, but he did not indicate any success. I gave him a CDC olive in exchange for a trico. I do not think he gained any luck, so I concluded that presentation skills were the key. Toward the end, I decided to work upstream more and landed two more rainbows where the river came back close to the road. By 5PM Jane grew impatient, so after releasing the last trout, I clambered up the bank, shed my waders, packed everything in the backpack, and biked back down the canyon. The foliage on the cottonwoods was brilliant, as we drove back to Stapleton. It was a warm day with temperatures in the 70’s, and I decided to bike up Waterton Canyon. I had not been to this stream in over a month, and I did not want to travel far to fish. As I was biking, a man pulled up beside me on his bike and began talking to me. 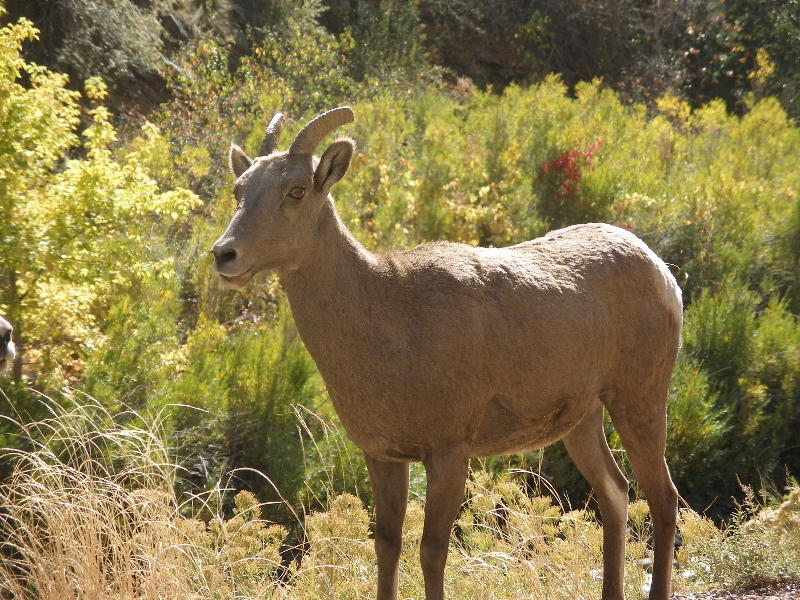 He said he fished Waterton Canyon quite a bit and seemed to be rather knowledgeable about what worked. He said he mainly nymphed and had much success with very small flies. He invited me to accompany him to where he generally starts, and he would share some flies with me. We parked our bikes at the picnic table beyond the first bridge in the upper special regulation water, and he gave me his version of an RS2, a black pheasant tail and a “Barrett Special”, a nymph with a green floss body. His name was Ken Barrett and he was a radio voice for concert ads in the 80’s and 90’s. I retreated downstream a bit, stashed my bike, put on my waders, took some photos, and began fishing back up to the bridge. I put on a size 12 parahopper and trailed a beadhead prince nymph. I caught five small trout on the prince nymph, four browns and one rainbow. I was experiencing success, but it was admittedly small stuff. I worked under the bridge and then approached a beautiful bend pool, where the main current deflected off a vertical rock wall. I could see six or seven trout lined up in the current below where it deflected off the rock. 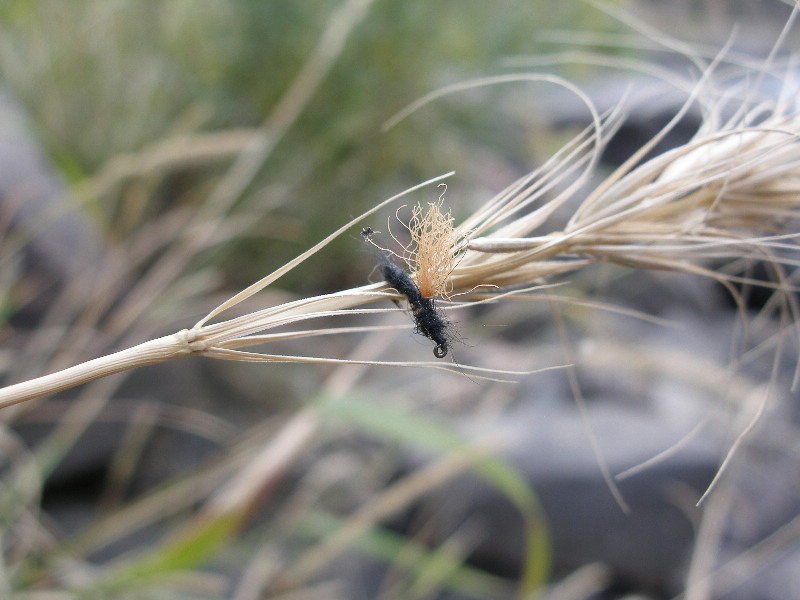 I also observed some BWO’s, so I concluded baetis were the preferred menu option. 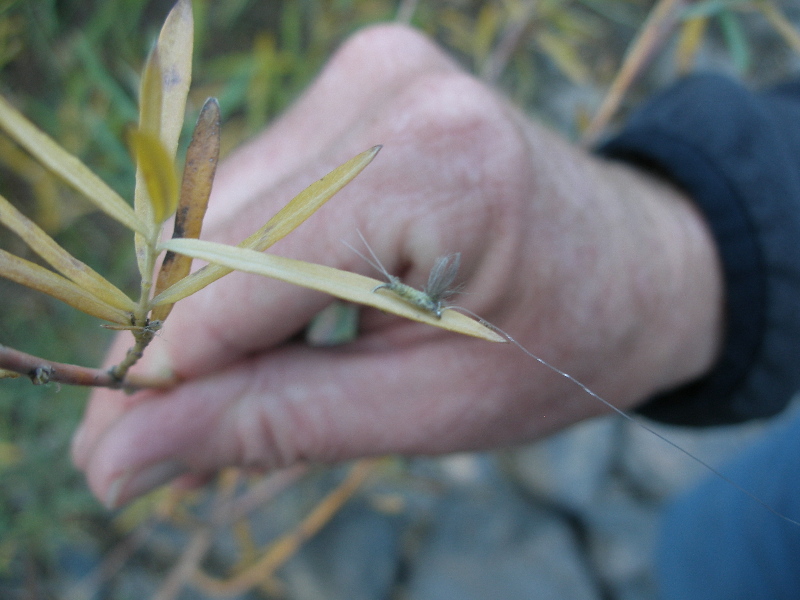 I tied on a CDC olive, but then I experienced an abundance of refusals and no luck. A change in tactics was in order, so I moved up to the head of the pool where the water had more riffles. Here I managed to take two rainbows. The rises occurred in waves. A flurry of activity transpired, and that was followed by a lull in feeding, before the rises reappeared. I noticed a couple fish rising about a foot from the far bank during one of the dead interludes. I decided to tie on a black ant with an orange poly indicator. I cast in the current that ran a foot from the bank, and a fish rose and engulfed my ant. The netted fish was a small brown, and then I spotted another fish rising 5 to 10 feet further downstream also a foot from the far bank. I provoked this brown to rise to the ant as well. However in the main runs at the head of the pool, they showed minimal interest in the ant. While I was catching the trout on the ant, Ken worked back downstream with his nymphs. He was on the other side and made the comment, “it’s really been dead for the last hour”. I asked if he had seen the subtle rises, and he said he had not. I advised him to try a BWO dry. He appeared to change flies, but eventually reverted back to nymphs. Meanwhile another wave of rises took place at the head of the pool, and I changed back to a CDC olive. I was able to catch and land two decent rainbows on the olive. I packed everything up around 4:30. As I biked back down the canyon, I spotted quite a few trout sipping in the slower moving pools, and I decided I needed to tie some smaller CDC olives and return in late afternoon in the near future.